On a subject that we have written about numerous times over the past few months, an excellent article appeared over the past weekend by Joe Grata of the Pittsburgh Post Gazette summarizing many of the large commercial/industrial projects currently underway or slated for a 2008 start. The jobs provided by these projects, as well as the number of current workers slated for retirement over the next 5 years means for the first time in a decade, Pittsburgh may have to import workers from other areas of the country. Add to this the two billion plus dollars in road construction to be spent in southwest Pennsylvania and the opportunity for those seeking jobs in this area will be unmatched anywhere around the United States. We will watch with interest what affect this has on the overall job numbers in the Pittsburgh Metro. Although 2007 has been the best year for job seekers since 2001, actual job growth has been anemic compared to both Pennsylvania as a whole and the country. According to the quarterly Manpower Survey on hiring manager’s recruitment expectations, Pittsburgh is about even with last year, with 23% of hiring managers expecting to increase staff levels, While 15% expect to decrease. One year ago the numbers were 23% and 13%. However, this reflects a large decrease in hiring plans from the 4th quarter survey where 36% expected to increase staff. How have the surveys actually reflected reality? This has varied quite a bit but generally has proven useful in predicting overall increases or decreases in activity. We at The Employment Guide are seeing recruitment levels in the hourly arena slightly slower than last year for fourth quarter but still remaining historically strong. The unemployment rate, as reported by the Pennsylvania State Center for Workforce Information and Analysis, held steady in October at 4.6% for the third consecutive month. This compares to a state rate of 4.5% and a national rate of 4.7%. Pittsburgh’s rate was down one tenth of a point from a year ago. The service sector accounted for the largest gain (up 5,200 jobs) lead by the education sector as schools reached full employment. However, leisure and hospitality lost 2,800 jobs, which is considered typical as seasonal businesses wound down and students went back to school. Education and health services reached record highs in October. Overall, the Pittsburgh metro area added 3,000 jobs from one year ago. How does this relate to employment OPPORTUNITY in Pittsburgh? Overall job growth in Pittsburgh has been anemic compared to both statewide and national growth figures over the past year. However, with population out migration and having one of the oldest median ages of any metro in the country, more residents are reaching retirement age than are entering the job market. This has kept opportunities for hourly and entry level jobs at high levels. We are seeing continued strong demand for mechanics, sales, nursing and allied health and unusually high demand for factory and warehouse jobs. Below is a map of unemployment rates from across the state for SEPTEMBER. Click on the image to increase size. What? Internet Recruiting is like Internet dating? We have read a number of good articles and blog posts recently regarding the difficulty recruiters are having in not only hiring qualified workers for open positions, but just getting them to show up for a scheduled interview. Because we deal primarily with hourly recruitment this is a complaint we are hearing more about even right here in Pittsburgh. Although this phenomenon is occurring at all levels of recruitment, it is most prevalent with hourly and entry level positions. The primary reason is not just the “millennial mentality” or increased lack of common courtesy anyone over 30 proclaims to be experiencing with those under 30. It could be due to the fact that because so much recruiting has shifted to large online job boards, the effort in applying to an advertised position has become so small that job seekers are able to spray their resumes to literally hundreds of listed jobs, agree to interviews with anyone who bothers to email them, and only then decide which interview they would rather go to, or whether their social life will permit investing the time required to go. Internet based recruitment has become virtually anonymous (pardon the pun) with very little “sweat equity” involved in its use by either job seekers or recruiters. The old fashioned print ads required much more work on both parties. Job seekers had to actually print a resume, sign a cover letter, lick a stamp and put it in a mail box or, heaven forbid, actually walk in and fill out an application. That’s not easy to do 100 times in a week. Here come Internet job boards and a job seeker has almost unlimited ability to send their information out. Conversely, recruiters can write a job description one time and easily post it on enough job boards to reach literally millions of job seekers within a week. Of course this leads us to the title of this posting. Whether you are a job seeker or a recruiter this approach can result in response overload. Just like a consumer utilizing a dating site and putting embellished information about who they are and responding only to those who appear to meet their needs (which is also embellished). How many “dates” set up through anonymous dating sites have resulted in no-shows? The recruiter will be confronted by hundreds of resumes that he or she could not possibly have time to view, let alone respond to, with a high percentage of them unqualified due to the sender not having to expend energy in applying (throw it against enough walls and see what sticks). Job seekers who complain about recruiters who do not acknowledge the receipt of their response are also victims of this development. Perhaps this will cause the Internet recruitment backlash that newspapers have been praying for since their classifieds began losing dollars to the web six years ago. Print will offer the potential of better prequalification of applicants for recruiters while making serious job seekers more likely to know whether their response has been received. A sense that the job holds a promising future for the worker, which includes a feeling that the company will be successful and that the individual worker plays a key part in that success. The company's involvement in corporate social responsibility initiatives. "This came as a surprise to us,"
Recognition of the worker. That's often a simple "thanks for doing a good job". Deriving a sense of accomplishment from the job. If you are a manager of other people, consider your own management style and how it affects turnover. It’s not about being friends with your employees. Good management includes the ability to reward and recognize as much as it does discipline. According to the Monster Local Employment Index Pittsburgh has become the second fastest growth market in the country for online recruitment. Particular strength was cited for the blue collar, hourly jobs arena including food prep, transportation and skilled technical jobs (mechanics, maintenance, repair). This is inline with what we have seen, as well as healthcare, hospitality and sales. Although this does not directly translate into improved job growth overall, it does show a strengthening of opportunity for job seekers in our area. The food preparation and serving category registered the highest rate of increase in online job availability during September, and is the top growth category for Pittsburgh year-over-year. Pittsburgh remains the top growth market among the 28 tracked by the Index for this category, indicating high demand in the local accommodation and food services industry. Arts, design, entertainment, sports, and media also posted a significant gain last month. During September, online job availability also continued to increase for major blue-collar occupations such as installation, maintenance, and repair; production; and transportation and material moving. In contrast, both protective services; and community and social services reported sharply fewer opportunities than last month. In the white-collar segment, the business and financial operations and legal categories both edged higher and remained moderately improved from a year ago. The only category showing reduced online job availability compared to a year ago is life, physical, and social science, which dipped two points, or two percent. In all, 15 occupational categories rose in September, while three declined one was flat. On the job news front over the past month it has been a mixed bag for Pittsburgh job seekers. The announced decision by US Air to cut yet another forty plus flights a day and the resulting loss of another 450 Pittsburgh area jobs was bad news. The good news out weighs the bad if measured on a job creation scale. Giant Eagle is purchasing Le Natures bottling plant in Latrobe. This will result in an immediate 75 jobs recreated, and the possibility of many more over the next two years. Also in the grocery business, Aldi’s Foods is in the process of adding 7 more locations around the southwest Pennsylvania area. No official job count has been released, but based on current per store staffing this should add more than 175 jobs over the next year. BONY / Mellon Bank has announced it will increase Pittsburgh area employment by at least 150 new jobs over the next year. Columbia Gas has announced it will be replacing more than 2,400 miles of aging gas lines over the next 20 year and create about 400 new jobs in southwest Pennsylvania. Totaling up these headline reports, we have 450 jobs leaving town (all from US Air) but over 800 jobs coming in. The Employment Guide and The Urban League of Greater Pittsburgh will host The 2007 Pittsburgh Diversity Employment and Career Education Expo at the Mellon Arena on Tuesday October 9th from 10:30AM to 3:00PM. 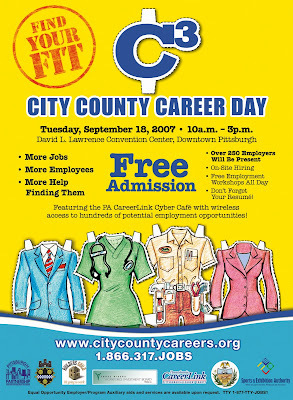 The job fair is free for all job seekers and no prior registration is required. Geared toward hourly entry level to mid level skilled positions, approximately 30 companies are expected to be on hand looking for qualified and motivated job seekers in multiple categories. Categories such as healthcare, nursing, skilled trades, office / clerical, retail, drivers, law enforcement, customer service and more, with career training opportunities as well. Some of the companies attending include Manpower, Boscov's, Giant Eagle / Market District, SMG, CareerLink, Maronda Homes, Transitional Services, First Student, Leeds, Lenzner Coach Lines, Mainstay Life Services, Pennsylvania State Police, Best Buy, New Century Careers, Student Transportation of America, Inc., Kaplan Career institute, United States Post Office, Army National Guard, Sunrise Assisted Living, Academy of Court Reporting, All State Career School, Verizon Wireless and more. Stay tuned for more updates as we get closer to the event. We were reading other Pittsburgh related Blogs last night when we saw Pittsblog had endorsed the reading of a frustrated job seeker's blog outlining her search for a higher level position in the Pittsburgh area with nothing but frustration and unprofessionalism from the Pittsburgh recruitisphere to show for it. 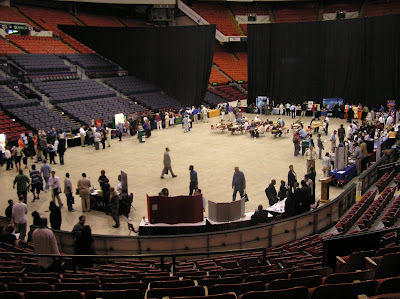 Our biggest interest came from Mary’s post concerning the attendance of a job fair that was held at PNC Park last June. We also decided to publicize her travail, because her experience relates to all job seekers and recruiters, whether entry level hourly jobs or highly experienced professional positions. As an organization that also produces multiple large job fairs each year, we hear most often from the “other side”, that is, recruiters who have attended our job fairs. Though many successes have occurred for employers and job seekers at these events, we have seen a common thread running among the recruiters who complain the most about not finding qualified job candidates for the positions they have open. Mary makes the point very well from the job seekers standpoint. Many recruiters, though with the best of intentions, simply are not people persons. That is, whether they are in Human Resources or head a department for their organization, they are not trained and are not good at engaging people in a public forum. We suppose most people who do this well are currently in Sales or Public Relations or Politics. This does not offer to excuse the behavior of recruiters, only to explain them. Blog postings like Mary’s should go a long way in educating company decision makers about how much they are missing out on available Pittsburgh talent because they are so enthralled with their systems that they forget what their purpose is. Rude or belittling behavior is unprofessional. Period. As for any other advice for Mary in her job search, please leave your comments and suggestions on her blog. It will be a shame for yet another intelligent professional job seeker to leave Pittsburgh for lack of opportunity (which are actually out there but unaccesable to those without connections). We suggest she contact The Urban League of Greater Pittsburgh, as they offer job search assistance for professionals as well as hourly. To read Mary’s postings and blog, here is the link. were not enough to stem a general summer slowdown in online recruitment activity. openings in an already tight job market. category year-over-year while military specific declined the most. With the job market in Pittsburgh turning a corner this year, what is being billed as the largest job fair in Pittsburgh history is taking shape for September 18th at the convention center in downtown Pittsburgh from 10AM to 3PM. Over 250 companies are expected to attend. The event is a partnership between the City of Pittsburgh, Allegheny County, PA CareerLink, the Builder’s Guild, the Pittsburgh Partnership, the Three Rivers Workforce Investment Board and the Sports and Exhibition Authority. The attendance goal is over 4,000 job seekers. This event is focusing on the building trades with multiple large construction projects slated to be under way in the next 2 years. There is now worry that the number of current workers available for these projects may not meet the demand. The Employment Guide is partnering to produce the event guide that will be distributed in The Employment Guide the full week before the event as well as at the event itself. This event guide will list many of the companies attending as well as the types of positions they are looking to fill. If you are a potential company that would like to attend this event, please contact the PA CareerLink Pittsburgh office for more information. The cost for companies to attend has been kept to a minimum due to funding from the various partners and special cooperation by the Sports and Exhibition Authority. For job seekers, attendance is free with no pre-registration needed. Seminars on many topics will be held throughout the day, including apprenticeship programs for all of the local building trade unions. Although the focus of the event is on the building trades, it is by no means limited to that area. Companies from all walks of life will be found eagerly looking for a chance to speak with qualified job seekers. 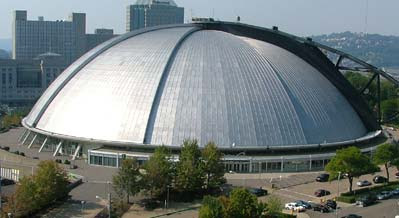 Many interviews will be held on the spot. Never have so many resources been available under one roof before. Stay tuned for more information as the event draws closer. This week’s hottest employer, based on severity of need or number of needs is AT Systems, a Garda Company. AT Systems, one of America’s largest and fastest growing cash logistics companies, is looking for armored driver / messenger applicants and also a cash vault processing teller (teller experience is required). Extensive background checks and pre-employment drug screens are required. For details on these positions and infoermation on how you can apply, pick up this week’s edition of The Employment Guide, or visit www.pittsburgh.employmentguide.com. What we have been extolling for the past 4 months is being born out by actual figures from the state. The Pittsburgh region added 9,200 jobs in May. We have been reporting that, as a job’s publication and Internet job board, we are seeing the increased demand for workers first hand, not only in our media but most others locally as well. We will still wait to celebrate because to truly affect the long term health of our area economy this trend will need to continue throughout this year and next. Fortunately, at this writing, we have not seen it reverse. In fact, this is shaping up to be the best summer season for recruitment since 2001 here in Pittsburgh. If you are a job seeker, the most in demand categories we are seeing right now are nursing (it is as tight as we have EVER seen it), sales people for most categories of products (including retail), truck drivers and anybody who knows how to work a socket wrench (mechanics). These seem to be where the the most demand is, but opportunities are becoming widespread across most job categories. We will continue to touch on the trends that we see from month to month. Our hope is that a year from now we will be able to look back and say early 2007 is when Pittsburgh finally turned the corner on job creation. pace for the month, the highest on record. Online opportunities in the leisure and hospitality sector also increased last month. after five months of escalating online recruitment activity. recruitment month in April with a sharp May increase. We read an interesting article on MSNBC that we need to share. There is a lot of debate as to the validity on both sides of the argument, that is, the difficulty for young people to find decent jobs in their chosen fields compared to past generations and the reasons why this may be so. Are many young adults today just not trying hard enough to launch their careers and gain financial independence? My June 4 column addressed how many parents were struggling to help get their adult sons and daughters on the right career path. I suggested their kids needed a little bit of tough love. Mom and Dad can’t keep the gravy train going forever, right? Well, I got a bunch of letters from folks who thought I was being too hard on recent graduates who couldn’t find jobs in their chosen professions. Some readers pointed to a lack of economic opportunities for U.S. workers thanks to globalization and a growing chasm between the rich and poor. It’s harder today for young people trying to make it in the world than past generations, many of you wrote. SMG and the Pittsburgh Penguin organization are going above and beyond to help the Urban League and The Employment Guide organize and hold our next big diversity job fair at the Mellon Arena in July. The intent of the Penguins is to have an informational booth at the event to begin communicating with the community about their future needs for employees and integrating with their neighbors to make the development as Pittsburgh centric as possible. This shows their statements about concern for their neighbors are more than just words. Hopefully, as completion of the new arena draws near and with it the development of land in the vicinity, informational booths will transition to become actual interviewing opportunities for hundreds of future hourly workers. The Penguins need to be commended for their pro-activity. As we draw closer to the event we will publicize the companies who will be in attendance. We expect 30 to 40 Pittsburgh area employers to be there. We hate to be doom and gloom but the Port Authority cuts that might come down the road, let alone the one’s we just experienced, are going to severely impact hourly workers across Allegheny County. Some workers will simply lose their job. If you make $10.00 per hour and cannot afford $3.00 per gallon gas, let alone a car with parking, how else are you going to get to a job that is no longer going to be serviced by Pat? We have an organization in Pittsburgh that is trying to help. Commute Info will be at our upcoming job fair. Please seek them out. Pittsburgh May Monster Job Index Continues Record Upward Trend! 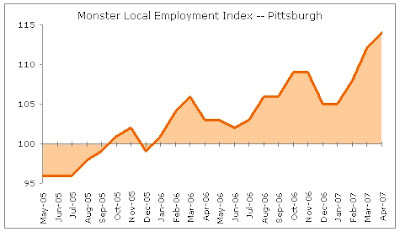 PITTSBURGH, June 18, 2007 – The Monster Local Employment Index for Pittsburgh gained two points in May, extending a four-month upward growth trend despite a general seasonal slowdown in online recruitment activity among several white-collar occupations. Strong demand for workers in education, manufacturing and construction helped the Index for Pittsburgh achieve a three percent annual growth pace for the month, the highest on record. Public sector specific occupations such as education, training, and library; and military specific led the Index in terms of growth during the month of May. Both categories have recorded extended growth streaks in 2007. The transportation and material moving; and production categories also registered sharp gains, suggesting improved local demand for manufacturing workers. Online opportunities in the leisure and hospitality sector also increased last month. Food preparation and serving related occupations noted the steepest year-over-year improvement in the Index as Pittsburgh maintained its number one position for the category among the 28 markets monitored. Sales occupations also reached a new peak after five months of escalating online recruitment activity. Meanwhile, the white-collar segment edged downward during May, marking an end to the spring recruitment season for entry-level professionals. Architecture and engineering occupations registered the most substantial downturn from the previous month, followed closely by computer and mathematical (IT); and management. Legal again proved to be the most atypical of the white-collar categories, following a muted recruitment month in April with a sharp May increase. In total, 12 occupational categories rose in May, while five declined and two were unchanged. Hottest Employer of the Week for June 18th! Each week we chose our Hottest Employer of the Week based on number of positions available or difficulty in filling available positions. Either way it means a good opportunity for jobseekers. This week our hottest employer is South Hills Movers looking for a number of Driver and Associate Mover positions. They are one of the largest moving companies in the nation and have been in Pittsburgh since 1925, offering competitive benefits packages to all employees with competitive pay rates, paid training and uniforms. 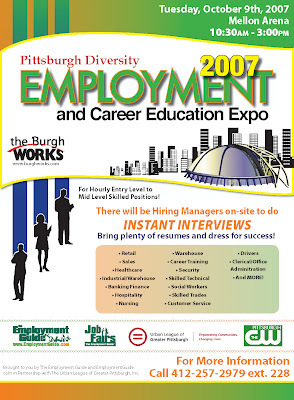 For more details pick up this week’s The Employment Guide or visit the web site at www.pittsburgh.employmentguide.com. We were notified recently that the State Police have unveiled a new cadet recruitment site at www.patrooper.com. The intent of the website is to make it easier to obtain information on becoming a Trooper as well as testing schedules and what current requirements are in effect. We found the new site very easy to navigate and well designed from a graphics standpoint. Information was easy to find and the overall effect is very web 2.0 (audio and video). State Police recruiters will be in attendance at our next big job fair on July 25th at Mellon Arena. 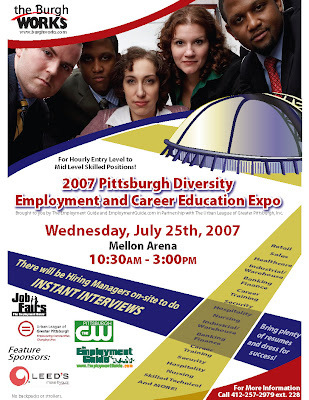 2007 Pittsburgh Diversity Employment and Career Education Expo Moves to the Mellon Arena! Our summer job fair event, the next big job fair in Pittsburgh, will be held Wednesday, July 25th, from 10:30AM to 3:00PM. We expect 30 to 40 companies to be in attendance looking for hundreds of job seekers to fill positions from a variety of needs. Banking/Finance, Customer Service, Retail, Sales, Hospitality, Skilled Trades and Transportation are just some of the job categories that will be available. 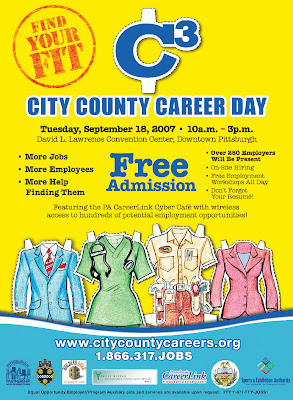 As we get closer to the event we will post more details here as well as The Employment Guide weekly print publication. This week’s hottest employer, based on either number of needs or severity of needs is the Wyndham Hotel University Place. Located in Oakland near the University of Pittsburgh campus, they are looking for all categories of hourly positions. For more details on positions and how to apply, pick up this week's Employment Guide. The hourly jobs environment in Pittsburgh appears to still be growing. We are seeing ad counts in many different recruitment media continue to grow. The outlook for the summer in Pittsburgh is as strong as we have seen since 2001. Over 600 part time hourly workers have been hired directly for the US Open that starts this weekend at Oakmont Country Club. We have been informed this morning the venue for our big job fair in July may not be available due to a possible new lease for the auditorium space we use on the concourse level. Stay tuned. If this turns out to be the case we have contingency plans for another venue. The most difficult entry level to mid level skilled positions to hire for in Pittsburgh right now are nurses, sales people, truck drivers, mechanics and machinists. These seem to be the jobs where demand is currently far outstripping supply. Stay tuned for an announcement soon on a new partnership between Comcast Cable in southwest Pennsylvania and the Employment Guide. Comcast is rolling out some new products for their viewers that will add even more value not just for job seekers but also local consumers in general. This week’s hottest employer, based on either number of needs or severity of needs is Consulate Health Care of Cheswick, PA., a 121 bed long term care facility located at 3876 Saxonburg Blvd, Cheswick, PA 15024. They are looking for multiple nursing positions including RN’s, LPN’s and CNA’s. For details on the positions and how to apply, pick up this week’s Employment Guide. This week’s hottest employer, based on either number of needs or severity of needs is the United States Post Office looking for casual temporary workers in multiple facilities and locations including the Northside, Warrendale and multiple post office locations in the 152 zip code area. They offer pay rates of $9.00 to $12.00 per hour. To apply call their job information line at 412-359-7515 or go online at www.usps.com/employment. Details of the positions can be found when calling and also information on application processes. Or pick up this week's edition of The Employment Guide. They are looking for dozens of positions to fill, making them our Hottest Employer for the Week. rose two points in April due to a general expansion in online recruitment activity. Over the year, the Index for Pittsburgh is up 11 points, a sharp increase from last month and the highest annual growth pace on record, suggesting strengthened local employer demand. month, while also accelerating on a year-over-year basis. We are still seeing unusual strength at the end of May, a period when recruitment typically slows down somewhat in anticipation of the holiday and vacation time coming with the end of the local school year. Of particular note are allied healthcare and commercial driver positions. But strength is mostly across the board. In speaking with a particular Human Resource Manager from a major employer in Pittsburgh (sorry, source does not want to be disclosed), an increase (though slight) in the number of recent immigrants applying is starting to be seen here, yet another symptom of increased opportunity. Each week we chose our Hottest Employer of the Week based on number of positions available or difficulty in filling available positions. Either way it means a good opportunity of jobseekers. The week our hottest employer is Crystal Spring Water looking for a number of different types of positions including Sales representatives, Route Sales Reps and Warehouse Personnel. Based out of Carnegie, this company has been in Pittsburgh since 1921 and offers competitive benefit packages to all employees with competitive pay rates. 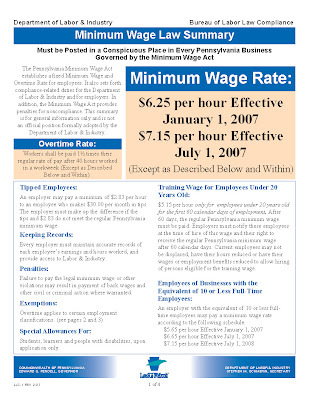 For more details pick up this week’s The Employment Guide or visit the web site at www.pittsburgh.employmentguide.com. A high employee-turnover rate has been a perennial problem for fast-food restaurants. Last year the rate rose to 130 percent. Despite rising wages, flexible schedules and even health insurance, the revolving door is turning faster than ever. "People know what needs to be done, but it is an investment," said Sherri Daye Scott, who has observed the ups and downs of the sector for more than a decade as editor of QSR magazine, a trade magazine that covers the industry.McDonald's Corp. believes it has found an answer: Make it a McCareer, not a McJob. On Monday, Oak Brook-based McDonald's announced a nationwide campaign promoting careers at the world's largest restaurant chain. The campaign was released two weeks ago in the Chicago market. "We think working at McDonald's is a tremendous opportunity, that this is a great place to work. You can start as a crew person like I did," said Karen King, 50, East Division president of McDonald's USA. More than 600,000 people work at McDonald's USA's 13,700 restaurants. King's division contains 5,000 restaurants.The hamburger giant tried promoting careers two years ago with mixed results by shining the spotlight on famous individuals who once worked at McDonald's, such as singer Macy Gray, 10-time Olympic track and field medalist Carl Lewis and professional speedskater Derek Parra.Now the firm intends to turn the spotlight on its employees. Even cutting the turnover rate, which matches the industry average, by a few percentage points would reduce the millions of dollars the restaurant chain spends annually on training. McDonald's declined to divulge how much it spends on training new hires.But King, in a dubious claim of distinction considering the high turnover rate, said, "We train more people than the U.S. Army." Jonah Kaufman, chairman of the national advertising committee for owner-operators and the owner of 12 McDonald's in the New York area, said the campaign using King; Ofelia Melendez, vice president of quality service and cleanliness in McDonald's Greater Southwest region; and other employees is aimed at raising the profile of jobs at the chain. "The world identifies who we are, and many times they don't do it correctly," Kaufman said. "This is our attempt to let people know the opportunities that are here. "We're frustrated because the opportunities are so great and the people who stay at McDonald's many times have moved up and feel good about themselves," he said, adding that he knows at least 10 owner-operators in the New York area who started as crew members. Crew member is McDonald's terminology for a person whose first job is taking and filling customer orders.Restaurant operators, whether they are operators of fast-food outlets or fine-dining restaurants, say the biggest task they face is the recruitment and retention of employees. "Many are becoming proactive at retaining the staff they already have so they don't have to go fishing in the shallow labor pool, as well as develop new tactics to reach out to new employees," said Hudson Riehle, senior vice president of research for the National Restaurant Association. "The industry's need for employees will remain unabated for the next decade," he said, noting that the industry is expected to create an additional 2 million positions over the next 10 years. Currently, there are 12.8 million people working in the restaurant industry.Jared Bernstein, an economist with the Economic Policy Institute, a Washington think tank, said McDonald's should have no trouble using the career program to recruit a higher level of employee. "I can tell you that there is robust supply of smart people stuck in low-wage jobs champing at the bit to get into a career ladder," he said. This is more of a concept than a company that is the Hot Topic for the week. The Pittsburgh area, as you know, is one of the oldest metros in the country. Because of this, we find ourselves in a situation where more residents are beginning to retire than we have young people coming in to replace them. This is good news for young people because it will make them more in demand by employers, but it also creates opportunities for all residents 55+ who wish to continue working, or pick up an extra income to help with retirement expenses. The Urban League of Greater Pittsburgh has put together a tremendous program geared for adults 55+ to help with job placement, resume assistance, employment counseling and even in putting together an individual Employment Plan. They also offer opportunities for paid on the job training. Employers are discovering the advantages of hiring adults 55+ including the life experience they bring, dependability, work ethic and responsibility. If you would like more information from The Urban League on their 55+ Employment, Training and Economic Empowerment Program, please call Angelique at 412-227-4177. Local unemployment rate plummets over past year. This is the headline for an article in today’s Pittsburgh Business Times and confirms what we have opined for the past 2 months. Pittsburgh is finally growing jobs again. The unemployment rate in Pittsburgh dropped to 3.6% in March. Harold Miller, CEO of Future Strategies LLC rightfully cautions not to get too overly joyous just yet. Part of the Pittsburgh area tightening can be attributed to a decline in the number of people seeking jobs, normally a sign of a weakening job market causing more jobseekers to get frustrated and stop looking. However, Pittsburgh could well be different in this area. We are losing overall population due to a higher death rate than birth rate. The seven county Pittsburgh metro is the second oldest in the country, due mostly to the outflow caused by the collapse of the steel industry in the 1980’s. What does this mean to the average hourly jobseeker? It means more opportunity. There are not enough new jobseekers coming into the market than are retiring. This is already beginning to cause business owners and recruiters much more of a challenge to attract not only qualified candidates, but ANY candidates for many of their positions. Especially their entry level skilled positions. In a previous writing we noted the local concerns of our young people coming out of high school without enough basic skills to compete for many of these jobs. Perhaps this will be the catalyst for foreign immigrants once again viewing Pittsburgh as a place where opportunity abounds. Hopefully this unnatural tightening will not have a detrimental effect of keeping businesses from opening or expanding in our area. We had an interesting long conversation with a friend who is a shop steward for the Sheet Metal Workers in Pittsburgh. He has been a sheet metal worker for 17 years and has worked through both good and bad times. The biggest concern for his union right now, with multiple large construction projects on the horizon, isn’t just finding enough qualified workers to fill positions, but finding enough who are dependable and responsible. They have bigger problems than in the past with no-shows, absenteeism and tardiness primarily among their apprentices. We both felt that this is the type of problem we wish we had to deal with in the past. He agreed the next 3 to 5 years look very good for job creation in southwest Pennsylvania. We will need to see positive job numbers become a trend over time before any celebration.